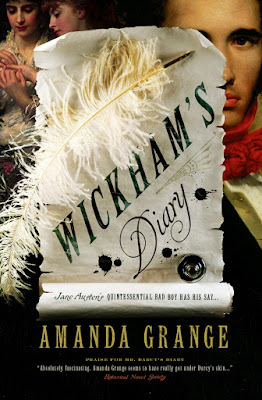 Wickham's Diary is a quick little foray into Austen's famous Pride and Prejudice characters and is worth each little page it is printed on. It can be seen as a sort of prequel to P&P from wicked Wickham's point of view as he grows more and more jealous of the brooding Darcy. Everything Wickham has he owes to the elder Mr Darcy's generosity, yet George Wickham had known from the start that he must marry an heiress in order to sustain his lifestyle. Not a very likable character is he, but a fun read nonetheless as I really enjoyed the inside look at George as he schemes for his fortune. The best part of the story was learning the background of George's parents, and I loved the character of his mother. Our favorite Darcy himself is not a big feature, as this novella is written diary style through Wickham and speaks of how annoyed Wickham is with Darcy. Georgiana is indeed a more featured character as George sets his sights on her, and I really wish the ending hadn't ended the way it had because it felt like there was a lot more to occur at that particular moment. There was no real sense of closure, but perhaps the author was leaving that up to Austen's Pride and Prejudice itself. Also, one must take into account this is a novella, and was seemingly meant as a explanatory precursor to the wild antics of George Wickham in Pride and Prejudice. I enjoyed it very much, and would have loved to have read it as an in depth novel. Grange's writing is perfect for evoking Austenesque tones and I look forward to perusing her backlist such as Mr. Darcy's Diary: A Novel , Captain Wentworth's Diary and Colonel Brandon's Diary .